Create your very own unique and beautiful stacked rings! 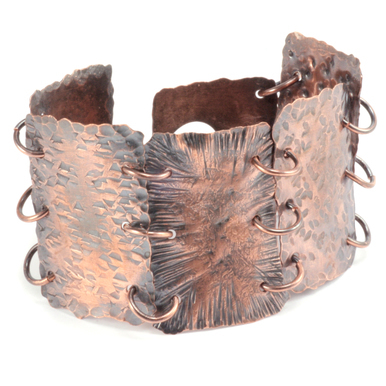 Instructor Aisha Formanski teaches you how to size, cut, shape and solder rings that will fit perfectly. The class takes the technique to the next level by adding texture and small blanks to the rings to add variety when stacked. This is a beginning level class for the jewelry maker who has been waiting to start soldering. The wait is over, let's solder! This class has a running time of 25 minutes. Aisha uses 14 gauge in this class. But, feel free to use any gauge 18 gauge or thicker. Silver Solder Paste SOFT, 1/4 oz - $19.00 - and Silver Solder Paste Hard, 1/4 oz. Check out our Get Started Soldering page for all the details on what you need for a soldering setup. I LOVE this class. This class is the primary reason for my new interest in working with metals and soldering. Aisha gives simple to understand step-by-step instructions. I've viewed this class several times and always take away something new. That's the beauty of Beaducation classes. You can learn at our convenience. Very helpful class! Easy to follow with great tips! Thank you! I had just made some copper wire rings and wanted to solder little charms on top and had no idea how to proceed. This class was excellent. Aisha explained everything clearly. Can't wait to solder charms! Thank you. Awesome free class! Thanks so much Beaducation for offering free classes! I learned so much in this class! You guys rock! I like this class for rings, however, you do not work harden the rings. This would leave the soft and bendable. Please add a step on how you work harden them. Thanks for your feedback! You make a great point. We found that shaping the bangle on the steel bracelet mandrel with a non-marring mallet, or shaping by hand with the Nylon Bracelet Pliers, work-hardens the bangle enough to keep its shape because we used a thick gauged material in this lesson. If a piece needed to be further work hardened, these same steps could be repeated. One of the most challenging parts about making rings is the cleanup after soldering. It was the main thing I was watching the class for and the step was completely left out. This class would be much better if they went through the clean up process at least once. Thanks for your feedback! The most common way to remove firescale from metal is by Pickling. Penny Brite can also be used to clean pieces individually. Step 4 of the Introduction to Soldering Class demonstrates traditional pickling with Sparex in detail. Also, more information about these product/tool options is available as Product Videos. Please contact info@beaducation.com if you have any questions. Great class! Always fun to learn different ways of doing things. I'm making rings for everyone! Aisha was very clear and detailed and I just love using the solderable accents! I've been watching all the classes about soldering because I want to master this technique. Thank you Aisha for another great, easy to understand video. I do have a question--what determines whether you use paste vs wire solder? Does it make a difference? Thanks for your great teaching videos!!! 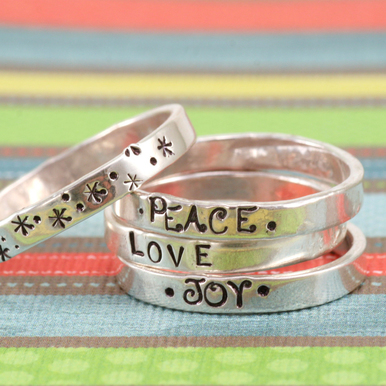 Question: for a ring that is hammered, what gauge wire do I need to stamp with 1.6mm font stamps? Does 16ga wire "spread out" enough to be stampable? Excellent video! Easy to understand step by step instructions really helped me feel confident enough to dive in. It was fun and doable! Loved the design suggestions, as well. Five Stars! !